The Lens & Light Honor is awarded to twelve photographers each year who are true leaders in the world of wedding photography. We look for photographers who produce stunning, modern, artistic imagery at the frontier of the field and for photographers who have achieved a rare level of success and recognition among brides, fellow photographers, and others in the wedding industry. We are proud to recognize Jerry Ghionis with the Lens & Light Honor. With more than 17 years of experience, Master Photographer Jerry Ghionis has accrued countless awards and accolades from clients, peers and leading industry associations. His bold, beautiful images and creative approach keep Jerry consistently ranking as one of the top wedding photographers in the world. Based in Melbourne Australia, Jerry is widely known for his powerful imagery and his ability to turn any setting into an incredible backdrop. Inspired by art, glamour and fashion, Jerry’s work reflects his passion for capturing the magic and story of each moment. Dedicated to giving back, Jerry is actively engaged in the industry. Through public speaking, workshops and his online educational website, The ICE Society, Jerry helps to push the boundaries of wedding photography. I’ve been shooting as a professional photographer for 16 years, and I started specializing in weddings right away. Like all young guys I wanted to photograph weddings because I thought it would be a great way to photograph beautiful girls and also because I thought it would allow me to make money quickly from the business. So I approached a very prominent studio at the time and assisted them for a year and a half with no pay – carrying bags until they finally hired me full time as a professional photographer. My style is very glamorous and natural at the same time. My images tend to have the finesse of a pose with the natural feel of a candid image. I place a big emphasis on the story telling aspect of the day, as well as shooting with empathy for more striking and powerful images. But in addition to that, I also make sure that I never leave a wedding without creating several “wow” shots. For this first image, I photographed a couple on a windy beach in Miami very late at night. It was a very magical night and I allowed myself to feel the moment. The wind caught the bride’s veil and it gave me the idea for another image paying homage to Michelangelo’s Creating of Adam painting that appears in the Sistine Chapel. The sky was completely dark but I exposed for it first. I then turned my white balance to shade to amplify any tones that were in the sky – even if I couldn’t see it with my naked eye. I then used off-camera flash to illuminate my bride. Because it was so dark, I needed a flashlight to focus on her first. 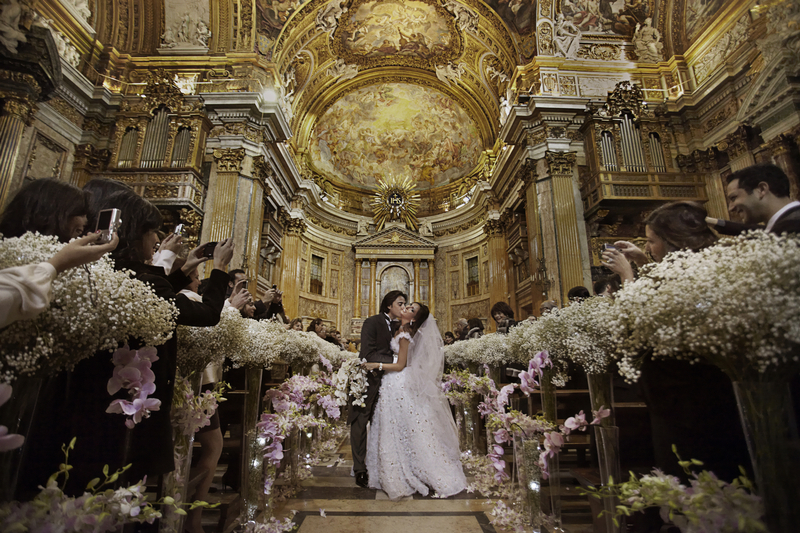 This next image is of a wedding I photographed in Rome, Italy. It is the only time that I have walked into a church and felt overcome by the sheer beauty of everything around me. It was one of the most beautiful and theatrical sights I have ever seen. As the bride and groom were walking back up the aisle after the wedding, I stopped them and posed them in a way to show off the grandeur of everything around them. For this image, I did an engagement session recently where all of the images were inspired from different movies I had seen. The inspiration for this particular image came from the movie Malena. There is a scene in the movie where the main character sits in chair in a courtyard, puts a cigarette to her lips and all of the men immediately rush to be the first to light her cigarette. Since I didn’t have ten different men to use in my image, placed my bride in a chair and set my camera onto a tripod. I made sure my focus point was on the tip of the cigarette. I then took my bride out of the scene and took several images of my groom in different positions. Then I combined the images later in Photoshop to create a unique composite image. This was one of the last images I took on the wedding day. It was pouring rain outside, but I convinced my couple that if they went outside for one last image it would be worth it. I had my assistant stand behind them with an off camera flash as the only light source and it created a beautiful effect in camera. I use a Canon 5D Mark II and Phase I camera system with a P40+ back. The lens I tend to use the most during a wedding day is the 700-200mm f/2.8 L IS. But aside from a camera or a lens, my favourite accessory would have to be jewellery and sunglasses. I am a strong believer in in-camera artistry although certainly believe in finessing an image in Photoshop to bring out the best in it. The advice that I give my digital artist when retouching an album is that I’m looking for “invisible Photoshop”. That basically means that most of my images will be colour corrected and will have some retouching but not much more than that. I feel that there is a new generation of photographers where many of them have become lazy shooters and then overzealously Photoshop their images. One of my favourite mantras is, “You don’t have to be the best. You just have to be better than last week.” And I truly believe this. I’m always trying to beat last week’s effort. If we’re talking about general inspiration, then fashion, music and cinema are my three favourite sources of inspiration. It’s the ability to work under pressure, think quickly, and create the best out of any situation. Bringing the best out of any situation is one thing that I really pay attention to every week when I’m presented with less than desirable locations. A photographer’s communication skills are their most valuable asset. The ability to read people and the situation will allow them to be able to bring the best out of their subjects. What do you think are the most important trends in wedding photography today? Let me answer this question by saying what I believe are the most unimportant trends in photography. I was recently surfing random photographers’ websites and a common trend that I saw was that many of them were focused on showing images of decorative details at the expense of exploring emotion, relationships, storytelling and glamour. Very few of the new generation truly understand lighting and posing and unfortunately many images that I see look like glorified snapshots. I don’t think it’s any secret that I want to be a singer in my alternate life. At the age of 15 I had decided that I wanted to be either a singer or a photographer. I decided back then that a photography career was probably the more viable option so now I just sing whenever I can! Thanks for sharing this post, very nice post !!! Such beautiful images and an interesting read, Thanks. Incredible beauty! All of your photos are ‘Wow’. Thanks for sharing! I’m a big fan of Gerry. Great to see him here on this blog. Great, classic photos. I love the bride and groom standing in the rain…! That is very cool, Jerry is a great source of inspiration for us, I keep on with the I.C.E. society chapters with him! So very nice to read your blog comments and see the gorgeous photos. You certainly deserve this honor. Kudos to you! It is obvious to me why you have been selected as one of the top five photographers in the world. Your work is true art. Thanks so much for the very informative interview and stunning photos. Great words! Life long learning. Occasionally I think I know something, but gladly there is always a sign to show that I’m nowhere. I always admire his work. Thank you for the valuable content in this article. I even took notes. I took a class from him a couple of years ago and I have great admiration for the talent and charisma that he brings to the industry. Jerry, you are the man. These images are simply stunning – if I could even produce something half as good I would be a happy man. Brilliant! I am amazed day after day about the spectacular imagery on BOWP. So glad to see you here. I am awed by your 2nd photograph in the church in Rome. You absolutely captured the sheer beauty. Wow! I was thrilled to see your work here, Jerry. BOWP gets better every day. Stunning imagery! WOW … spectacular photos. And congratulations on this recognition! Amazing photos! I’m just a beginner and you inspire me more. I know in time i’ll be learning more..Keep on posting please. Thanks! Amazing control of light and composition ! Gorgeous and stunning photographs. Exquisite photography! Fantastic images – an inspiration to us all. Many thanks. Even though he’s at the pinnacle, I love his desire to always be better. Jerry is one of the best in the world and he keeps getting better!!! Brilliant! My eyes are wide open and I had a great time watching over those images..Simply unique! Awesome! Jerry is an amazing photographer! I’m always inspired by his images. October 2010- About 30 C° and a great and very nice wedding day in Bordeaux. A really big event : pretty bride & groom and beautiful venue with 600 guests ! WOW! What a beautiful wedding! This is a beautiful set. Lovely photography. Thanks for sharing. Oh my! What a lovely surprise to see your photography. Love how you captured every emotion possible that, especially the groom’s tears. Bravo! very nice pictures – congratulations! I really like black and white photos, and yours are spectacular! I started with my favorite as the third image from the top, but as I kept on goung I found many other great ones, so this time I can’t pick my best, But i think its the fifth from the bottom (bride&groom dancing together). The shots of the church are magnificent. Nice work. I especially love the very last shot of the parents dancing. I love the sense of space and stillness that your images capture! Wow! The images are breathtaking. I love the historical architecture. What an amazing setting for the start of this couple’s life! Those images on the cobblestone are great! So quaint and so beautiful. Great use of natural lighting, also the post-production is very fine! Congrats! Wow! An absolutely stunning set of images. I’m very impressed. Every time I check this site out, another amazing photographer shows up. Your work is beautiful! Can you take one more comment? Magnificent is all I can say … this series is wonderful. More than a nice day in Bordeaux. Phenomenal work! Thanks so much for sharing! Absolutely amazing photography …. thanks so much for sharing and how you magnificently worked with the angles and lighting! Great stuff! How motivating and inspiring. These are incredible photos. They are so crystal clear (brilliant colors and amazing black and white imagery). Gorgeous! Hard to choose between photos 4, 5, and 6. They are incredible! All of your photography is fascinating! Thanks for sharing. wowww what a beautiful place! Oh my goodness, these shots are amazing. The colored images are so vibrant, and the black and white very vibrant. Beautiful photographs. #4 and #5 are absolutely true works of art — phenomenal. The second last black and white photo is stunning … beyond words. Kudos! You have made these images look just like paradise. Completely and totally gorgeous. Spectacular array of imagery. Thanks for sharing. Stunning mate. Simply stunning. Love your work. What an amazing location! The photos are fantastic…thanks for sharing them. “Forever and ever” This collection kinda gives off this feel. Good job! Spectacular photos! Such beautiful artistic skill! Some striking captures here guys. We just bookmarked you, great work! thanks to all for the lovely comments! I have to agree with the others – truly inspirational. I’d love to get the clients willing to do this. It will combine perfectly my business of wedding photography together with my passion for seascapes. Keep up the great work in 2011! These are incredible and I mean incredible shots. I could view them every day, hour after hour. Magnificent! And I second and third agree with all these comments. Beautiful work! What an awesome set of photos! Hi, We were so delighted with these shots and enjoyed every aspect of the whole process-the trip to Hook was one of the best parts of the day! Shane was fantastic to work with, so much enthusiasm and professionalism, not to mention the obvious talent! Thanks a mil Shane! The fourth image is amazing — the colors and the lighting are excellent. Stunning photography. So glad I checked in. Gorgeous images in such amazing loactions! If you ever need a 2nd shooter, I’m available. LOL! Lovely set of images, fantastic location. True works of art! Such beauty! Your imagery simply takes my breath away! Way to go! Brilliant! Incredible and stunning is how I would describe these outstanding images. Beautiful … I could stay on this site all day just viewing your incredible work. Beach! Light house! So romantic. A great day in Provence in last september at the Joséphine and Rogier’s wedding. Superb and brilliant photography! Absolutely beautiful (both color and black and white images). Superb and amazing imagery. Wow! Those first two images just blew me away — so articulate, clear, and breathtaking … and then I viewed the rest of them. Oh my goodness, they are all wonderful. Really, really enjoyed viewing your blog … and I know, I’ll be back time and time again. Like to say your photography images are excellent. Fantastic use of available light and creativity. Love to shoot a wedding in France one day. Awesome work guys. That last B&W image is amazing!! really love it. Exceptional and brilliant photography. Absolutely love the last image (although all are fantastic). I am totally fascinated with the brilliance and crispness of your 2nd photograph. Amazing! Oh my goodness, your first and leading image is a true work of art …those colors are absolutely amazing!! Wow, the first two photos are amazing (as are all the others) — such detailed crispness and awesome colors. Thanks! Gorgeous … the lighting, the angles, the vivid colors (greens and blues). Aix is my favorite place in the world. I can’t decide if I’m more jealous that I wasn’t the photographer for this gorgeous wedding or that I wasn’t the bride! Beautiful photos! Beautiful photographs … and you sure captured the fun and joy of the day. Love how you superbly captured the lighting of the tent overlooking the gorgeous pool and landscape. All photos are great! Really enjoyed the photo of the three ladies peeking out the window … so playful and cute. Some great moments captured here!!! and of course the last one is my favorite! Excellent wedding imagery — the full day from beginning to end. The wedding aisle shot is beautiful and unique. Wow, great photography and that last image is fantastic. Love it. You captured a beautiful wedding story — excellent shots! Bravo for the amazing documentary of this wedding. Just love Image #5 … the emotions are fully captured. Love your photography artistic talents. This is a blog that I will continue to visit. You captured every single emotional moment that could happen on a wedding day. Love it! Love the black and white photo of the bride and attendants peeking out the window. Beautiful wedding documentary. Your work is amazing. I really enjoyed this full set of images … every emotion that could possibly be felt are beautifully displayed. Such a beautiful couple and fantastic imagery. From the very first photo to the very last — beautiful lighting and imagery. Stunning imagery, love the candid captures. Beautiful wedding story from beginning to end. You captured everything in this story — the emotions (including candid photos) and all the beauty and love. Way to go! I really, really enjoyed this series of photos. You do magnificent work, and I am so glad you shared your blog posting with us. Its so much fun to photograph destination weddings… been a few years since I’ve done one out of the US, but I do remember how great they were. Would someone be able to tell me where this wedding was held. I am currently planning my wedding and this venue looks beautiful. Love the black and white tones. Amazing work. Nice post: wedding in Aix en Provence; South of France | Best of Wedding Photography. I was checking continuously this blog and I am impressed! Very useful info specially the last part 🙂 I care for such info a lot. I was seeking this particular info for a very long time. Thank you and best of luck. I was wondering where is the location????? Just stunning!! I too would love to know where this wedding took place…I am planning my wedding and can’t stop thinking about this venue! I’m going to keep this brief in fear of going too overboard with long winded descriptions gushing with stories of this wedding being the; funnest, coolest, warmest, freshest, most honest, most beautiful wedding, I’ve been fortunate enough to document. Replace ‘wedding’ with ‘bride and groom’ and you get the short version of the big picture. Shannon and Pete got married at a place called Bush Bank in Kiama, which is on the South Coast of New South Wales in Australia. They got married on the 10th October, 10-10-10, and for everyone involved their wedding was nothing less than a 10 out 10. I really hope you enjoy these images as much as I enjoyed capturing them. You are right! These are fantastic! My, what a beautiful wedding! Job well done! Gorgeous images, lighting and angles. I just love the amazing colors of the flowers and trees of the picture of the groom following the bride across the grass. These are great, well done photographs that match the gorgeous style of the wedding perfectly! I really enjoyed this blog posting. Beautiful Australia. Oh, and you captured the many emotions of the day. Nice! Incredible photography .. I could spend the next day or month or two just living the beauty you created. Thoroughly enjoyed this whole series. You captured me right from the first photo in the Barber Shop. Brilliant! Brilliant and beautiful imagery from beginning to end. Loved everything, especially your artistic talent. #27 is by far the pinnacle of this whole session. So awesome! It’s great how you captured the pure joy of the bride in the black and white photo (#9). Nice. Thoroughly enjoyed these gorgeous photos. You captured the very essence of the southeast coast of Australia. Brilliant work. Remarkable capture of expressions on the little flower girls shot, contemplative, serious, and full of awe. Bravo — a moment to treasure forever. Terrific wedding imagery. Wonderful how you captured every single emotion the bride felt that day. What a splendid array of colors … the image of the guests tossing delicate flower petals upon the couple. The seventh image from the bottom of the sky/clouds over the water is magnificent. The photo of the bride and groom under the tree is amazing — great lighting and beautiful colors. Your images are SO REAL! Thanks so much for sharing such brilliance with the rest of us. Wow, that flash photography is well used in the little house next the road! I guess you used radio transmitter..? Hi Chaba, thanks for your kind comment. The answer to your question, is yes, I did use a transmitter.